Your best weight-loss intentions will inevitably come face-to-face with temptation. 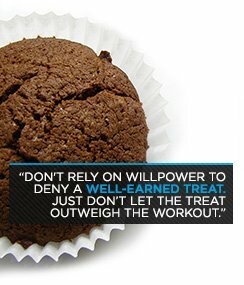 Learn to boost your willpower, and keep the pounds off. It was right there for the taking. After a 5-mile group run, I drove past my favorite takeout place. My stomach was craving—no, demanding—food. A lot of it. I had a recovery shake waiting for me at home, but this was so much faster. Besides, I deserved a reward for burning off almost 800 calories. What's wrong with a tasty payoff for my commitment to health? I turned into the drive-thru lane. My willpower had failed me. Yes, it had gotten me to my run on time, but it vanished when I needed it most. Any gains I'd made I gave right back. Why couldn't I say no? It turns out that willpower isn't simply dense moral fiber. The latest science suggests it's found in the soft gray matter of your frontal lobe, where good decisions are made and poor choices are rejected. Your willpower is tough. It helps you fight temptation, prevent binges, choose food wisely, and stay motivated. But it's a finite resource. Nurture it, maintain it, and deploy it with this six-point plan. Here's a surprise: Your willpower runs on sugar. Like your muscles, your brain needs glucose to function at an optimal level, says Roy Baumeister, Ph.D., social psychology area director at Florida State University and coauthor of Willpower: Rediscovering the Greatest Human Strength. In a series of nine studies published in the Journal of Personality and Social Psychology, Baumeister discovered that people with steady glucose levels were more persistent at attempting to complete an unsolvable task than those whose glucose levels declined during the experiments. "Increase your blood glucose and you can fuel your willpower," he says. Wait, put down the Skittles. Sure, glucose is easily available from straight sugar, but your body also creates it from fruit, many vegetables, whole grains, and dairy products. You can even build glucose by pumping up your protein, says Baumeister. "It takes your body longer to make glucose from protein, but the benefits can last longer," he says. One problem is that weight-watching men often adopt extreme low-calorie diets. "If you starve yourself, you'll have low glucose," says Baumeister. And without sufficient glucose, your brain doesn't have the fuel it needs to resist junk food. So if you feel your energy fading, don't skip smart snacks, like nuts. Scientists have a name for my drive-thru cave-in: compensation. It's the inclination to reward yourself for a job well done, and that feeling can fight with your weight-loss intentions. In fact, the harder your workout is, the bigger you may think your compensation should be, says Timothy Church, M.D., Ph.D., director of the laboratory of preventive medicine at the Pennington Biomedical Research Center at Louisiana State University. 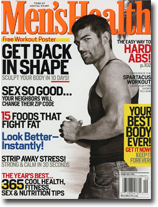 "When men endure a tough, hourlong workout or push through a 7-mile run, they feel a need to celebrate," he says. "But a good workout is not carte blanche to eat whatever you want." The solution: Don't rely on your willpower to deny yourself a well-earned treat. Instead, use it to ensure that your reward doesn't outweigh the workout (literally). "Do the math: If you burned off 700 calories, keep your food intake to less than that," says Dr. Church. It's a pat on the back that doesn't wipe out your hard work. Or go with a nonfood reward: Buy yourself an iTunes download every time you work out, or treat yourself to basketball tickets when you rack up 10 training sessions. Even well-fed willpower won't resist all temptation. You'll need to conserve your supply so it's always there for you. A recent study in the Journal of Personality and Social Psychology followed people's reactions to enticements throughout the day. Oddly, people with the best self-control were the ones who used their willpower less often. Instead of fending off one temptation after another, they set up their daily lives to minimize them. In other words, they played defense. "Look inside people's fridges—they're full of temptations," says lead researcher Wilhelm Hofmann, Ph.D., assistant professor of behavioral science at the University of Chicago. Leftover Chinese, Ben & Jerry's, cans of Coke? Toss it all and don't buy it again. There—now your willpower can get some rest at home. Want to make smart choices? Go to bed early. "Willpower is lower when you're sleepy," says Kelly Glazer Baron, Ph.D., a clinical health psychologist at Northwestern University who specializes in behavioral sleep medicine. The average night owl consumes an additional 248 calories more each day than someone who goes to bed earlier, and most of those extra calories tend to be racked up after 8 p.m., according to 2011 research published in the journal Obesity. Short night of sleep? Pour a cup of coffee and add a packet of real sugar—not Splenda or some other artificial sweetener. A 2010 Spanish study revealed that the combination of caffeine and sugar increased cognitive performance in the bilateral parietal cortex and left prefrontal cortex regions. These are two areas of the brain that support your ability to stay focused and goal-oriented when confronted with tempting distractions. It's easy to rationalize and convince yourself that one more plate of sliders won't make a difference to your waistline. To fuel your resolve, try taking the opposite approach—tell yourself a tall tale. A University of Texas study published in the Journal of Consumer Research found that exaggerating the number of calories in a favorite food—a tactic called "counteractive construal"—can help you override those temptations. That hot, slender girl who recoils from pizza? She's onto something. Overestimating the impact of a gut bomb can help establish a clear, direct link between "bad food" and "being out of shape." Imagining that a cheeseburger contains 2,000 calories can prompt you to start picturing yourself with an extra 20 pounds. And that will help you say no. When it comes to food lures, procrastination can be a good thing. Instead of simply saying no to that nacho platter, tell yourself you'll eat it sometime in the future. A study presented at this year's annual meeting of the Society for Personality and Social Psychology found that people who decided to postpone eating a bag of potato chips were more capable of resisting the temptation than people who simply tried to refrain altogether from eating the crunchy, salty snack. While "no" only intensifies feelings of deprivation, "later" has a different effect: "Postponement weakens the desire at the precise time when peak desire overwhelms willpower," says study author Nicole Mead, Ph.D., of the Rotterdam School of Management. It's unrealistic to postpone all unhealthy foods and drinks, she says. Instead, pick one or two that tempt you the most and postpone those. Add more over time and you'll reap even bigger results.